Here’s a list of exhibitions, podcasts and lectures well worth seeking out in February, March and April. In Connecticut, at the Wadsworth Athenuem in Hartford SHE: Images of Female Power from the Permanent Collection is on exhibit through April 2, 2017. The exhibition considers: What does female power look like? The intimate installation takes that question as a starting point to consider works from across the Wadsworth Atheneum’s collections, from Egyptian sculpture to Pre-Columbian ceramics to photography and textiles by contemporary artists. Included are images of goddesses, queens and protectresses. The exhibition features works by Ana Mendieta, Elizabeth Catlett, Lorraine O’Grady, Norma Minkowitz and Mario Carreño, among others. 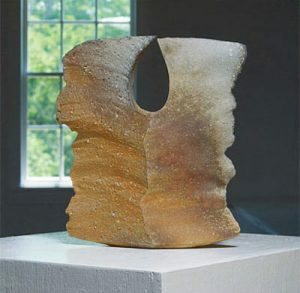 Norma Minkowitz will speak at the museum on March 30th @ 12:00 pm – 1:00 pm followed by a guided visit to her groundbreaking sculpture Goodbye Goddess. Also in Connecticut, at the Yale Art Gallery in New Haven, Small-Great Objects: Anni and Josef Albers in the Americas examines intersections between the art-making and art-collecting strategies of the Alberses, two of the most influential figures of 20th-century modernism. As the Gallery notes explain, “Between 1935 and 1967, the couple made numerous trips to Latin America, namely Mexico and Peru, and amassed a large collection of ancient artworks from the region. The exhibition looks at these objects in depth and considers how Anni and Josef’s collection supported their aesthetic sensibilities and teaching practice. 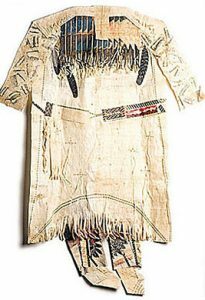 In addition to objects from the ancient Americas, the show gathers together dozens of works that the couple made, including textiles, paintings, works on paper, and rarely studied photographs that Josef took at archaeological sites and museums.” Demonstrating the Alberses’ deep and sustained engagement with ancient American art, Small-Great Objects explores a fascinating dimension of the couple’s creative vision. This exhibition is accompanied by a free podcast, available in the gallery space and online at http://soundcloud.com/yaleartgallery/sets/small-great-objects. 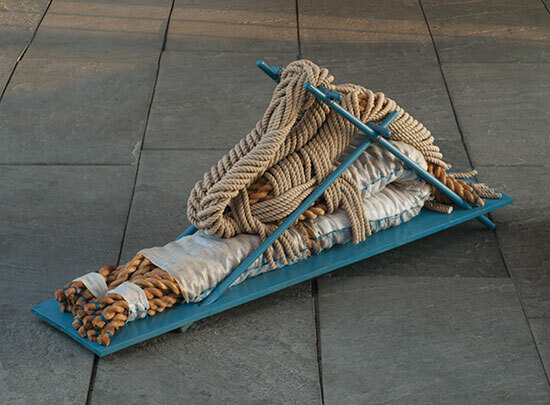 In Massachusetts, 31 works by international artists are included in Excellence in Fibers at the New Bedford Museum of Art. 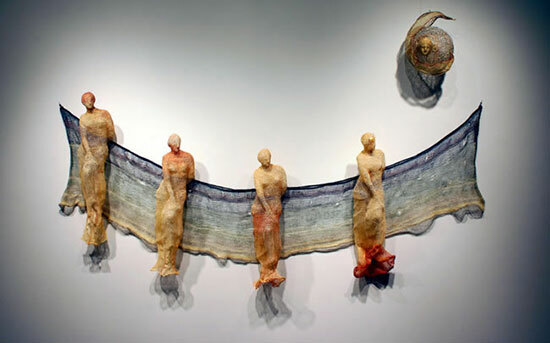 Organized by Fiber Art Now magazine, submissions from around the world were reviewed by jurors Emily Zilber, Curator, MFA Boston; artists Gerhardt Knodel and Norma Minkowitz and Melissa Leventon, former curator at the Fine Arts Museums of San Francisco. On Sunday, February 19th at 2 p.m., MAD’s Windgate Research and Collections Curator, Elissa Auther, will discuss the historical context of Grossen’s work. 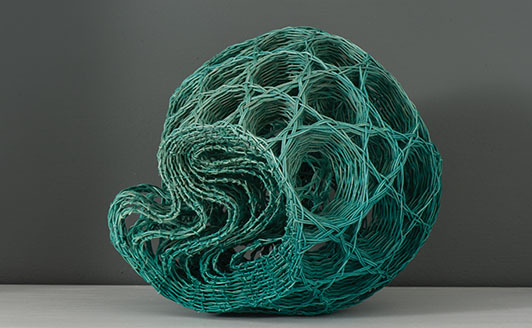 Auther will also discuss the advance of thread, rope, string, felt and fabric from the “low” world of craft to the “high” world of art in the 1960s and ’70s, as well as the prominence of fiber in art today. For more information visit: http://madmuseum.org/exhibition/françoise-grossen-selects. 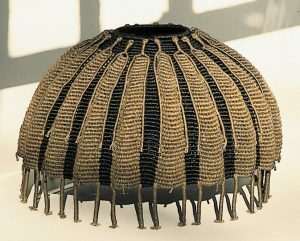 Printed and Painted The Art of Bark Cloth (through August 27, 2017); and Shock Wave: Japanese Fashion Design, 1980s–90s (through May 28, 2017). From the Fire includes work by Yasuhisa Kohyama, among other ceramicists. Tianlong Jiao, the Joseph de Heer Curator of Asian Art at the Museum traveled to Japan to visit these artists in advance of the exhibition. You can read about his trip here: http://denverartmuseum.org/article/fire-curator-writes-about-his-trip-shigaraki-japan. In Tulsa, Oklahoma, at 108 Contemporary, you’ll find Living With Art: the Newman Collection (through March 19th). In the exhibition, art objects from Rita and Don Newman’s eclectic collection, including works by Ed Rossbach and Mary Giles, are displayed alongside pieces of furniture owned by the couple. 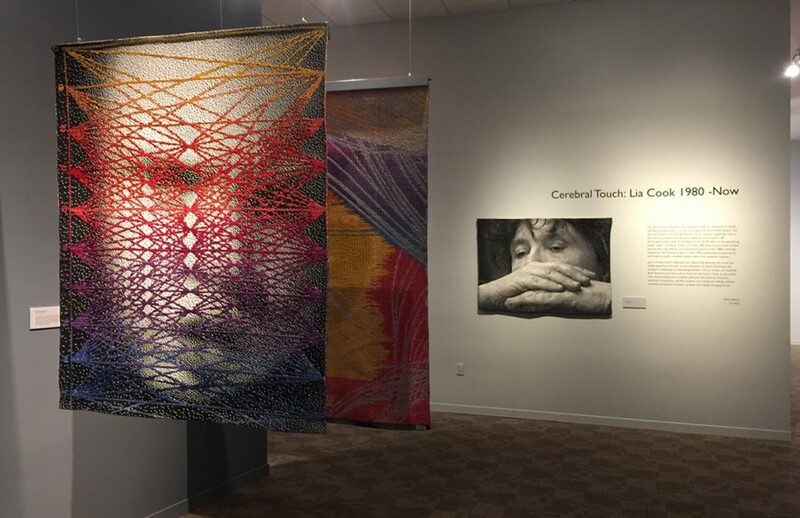 Further West, the San Jose Museum of Quilts and Textiles in California has turned itself over exclusively to weaving for the Spring, with four separate exhibitions. They include: American Tapestry Biennial (through April 16, 2017); Line DuFour: Fate Destiny and Self Determination (through April 16, 2017); Elemental Tapestry: Earth, Air Fire and Water — Tapestry Weavers West (through March 5, 2017); Embedded Patter: Three Approaches, Deborah Corsini, Alex Friedman, Michael Rohde (through April 17, 2017); and Cerebral Touch: Lia Cook 1980-Now (through April 16, 2017). Cerebral Touch traces Cook’s artistic journey from her abstract and dimensional pieces of the 1980s; weaving inspired by Old Masters drapery from her work during the 1990s; exploration of portraiture; and finally, work completed just weeks before this exhibition opened that explore the sensuality of the woven image and the emotional connections to memories of touch and cloth.